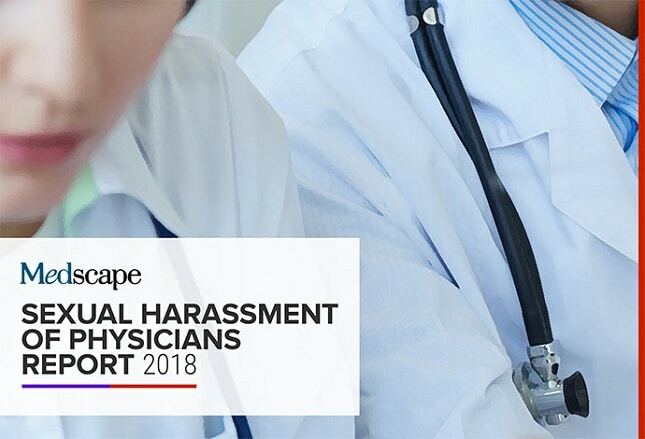 Medscape's Sexual Harassment of Physicians Report 2018 shows results from more than 6200 physicians and clinicians in the United States. We asked respondents about specific harassing behavior they have experienced or witnessed, where it occurred, how they responded, and how it affected them. We also asked whether they had been accused of sexual harassment. Our comprehensive report describes the current state of sexual misconduct in the healthcare realm by asking about instances occurring within the past 3 years. Individuals have their own perceptions about what defines sexual harassment or abuse. To make sure that respondents are all on the same page about definitions, we asked about specific behaviors. In Medscape's report, 7% of physicians said they experienced some form of sexual harassment within the past 3 years. (This compares with 11% among nurses, nurse practitioners, and physician assistants, which will be detailed in an upcoming Medscape survey report.) Overall, of all clinicians, 10% of our respondents were sexually harassed within the past 3 years. In our survey, respondents could choose more than one answer to many questions, so some totals may exceed 100%. Elsewhere, totals may not add up to 100% because of rounding. Unsurprisingly, more female physicians than male physicians have experienced harassment. Most complaints of sexual harassment sent to the US Equal Employment Opportunity Commission and Fair Employment Practices agencies were made by women, according to an analysis of complaints between 1997 and 2011. When it comes to being accused of harassment, men outnumber women. Nine percent of medical residents experienced sexual harassment; of those, about three times more women than men experienced sexual harassment. "I didn't have a seat to sit at in clinic and the attending said, 'You can sit on my lap.'" "The attending stood way too close to me, held my hand, and pressed up against me, under the guise of teaching." Infringing on personal space, leering, groping, and unwanted hugging were most frequent. Among female physicians who were harassed, 61% reported infringement on body space, and 59% reported sexual comments or leering. The most serious instances of assault were infrequent, but very upsetting to the victims. Physicians who experienced harassment were often targeted multiple times. Texts, emails, sexual comments, and leering were the behaviors most often repeated. About one third of those reporting harassment were victimized by one perpetrator; almost one half had two to three perpetrators. The likely situation was that they had been harassed more than once. Whereas 79% of physicians (nonresidents) reported having one to three perpetrators, 65% of residents had one to three perpetrators. Sadly, 12% of residents reported that they had over seven perpetrators engaging in harassment or abuse. Harassing or abusive behaviors have an impact on physicians' well-being. "Many who have experienced harassment and abuse will demonstrate such behaviors as posttraumatic stress disorder, suicidal ideation, and lessened ability to make decisions," says Susan Strauss, RN, EdD, a harassment and bullying consultant and expert witness, in Burnsville, Minnesota. "Many victims question their self-worth and ask, 'What did I do to deserve this?'" Almost one half of the perpetrators were other physicians. About 30% of the perpetrators were "others," which included administrators, nonmedical personnel, and patients. Among the physician respondents who stated that the perpetrator of their harassment was another physician, 25% were men and 60% were women. Medical residents reported that physicians were the most frequent perpetrators. Other residents were also guilty of harassment. By far, more women physicians are harassed by men. Almost one quarter of male physicians who were harassed named men as the harasser. (Fewer men tend to report harassment or abuse, because it is embarrassing to them). Power dynamics are potent factors in leading to sexual harassment. Clinicians or administrators in positions of higher power were more likely to harass those in lower positions. Still, about one third were in a subordinate position. "The medical director propositioned me. I refused. I got fired," said one physician. Among physicians who experienced harassment, 28% were harassed by primary care physicians, whereas 72% were harassed by specialists. No particular specialty stands out as having a significantly higher percentage of physicians who perpetrate harassment. The chart shows the percentage of specialties in which perpetrators practice compared with their percentage in the total physician respondent population. For example, family physicians and internists were named proportionately less than their percentage of respondents in the survey, whereas surgeons and emergency physicians were named proportionately more. Although harassment of physicians was most likely to occur between the ages of 35 and 44 years, few age groups were completely immune to harassment. "Harassment is not always about sexual attraction," said Strauss. "It's often just about power." Administrative areas and hallways were among the most common venues for harassment or abuse. Residents noted that 26% of harassment incidents took place in the operating room, compared with about 13% for physicians overall. More than one half of those who were harassed suffered in silence. They didn't say anything to or confront the perpetrator at the time of the incident. Others did speak up, with varying degrees of success. "It's not surprising that such a large percentage did not speak up," says Strauss. "Across all industries, the major proportion of people who are harassed or abused do not confront the perpetrator or report the incident." Medical residents were more likely (78%) than working physicians (55%) to keep silent and not confront the perpetrator when a harassing incident happened. Only 40% of physicians who were harassed reported the offensive behavior. "The perpetrator made multiple comments about my size and body. He always stood or sat near me, watching everything I was doing. I first asked a mutual male friend to tell him to back off, but his behavior worsened instead, so my next step was to tell HR about him because I felt threatened at work." A male physician reported, "I have been grabbed repeatedly by a male nurse; even once my rear was forcibly grabbed and groped while treating a patient under anesthesia. When I made a complaint, nothing happened to him. They forced us to keep working together. It has been a demoralizing experience." Most victims of harassment reported the perpetrator to a colleague or to the department supervisor. In many cases, small or medium-sized group practices don't have a particular HR department to turn to. Less than one quarter of the incidents reported resulted in an investigation. "Most places don't know how to conduct an investigation, and many HR departments don't recognize the nuances of sexual harassment issues," says Strauss. Reporting the harassing behavior sometimes rectifies a situation, but often can bring negative consequences to the person bringing the complaint. More than one half of those who complained said that either their report of the incident was trivialized, or there was some form of perceived retaliation. "The company has a harassment policy, but it's a joke that anything will be done about it, and all people know this. When the boss brings millions of dollars to the company, no one cares. It's just going through the motions, and all females know this," said one female physician. "Those who do report are looked down upon for it." Those who didn't report the incident typically feared that they'd be accused of overreacting. Among medical residents, fear of being accused of overreacting or belief that nothing would be done were the major reasons for staying silent. Fear of retaliation influenced about one third of those who did not report the incident. Sexual harassment incidents, especially those that create a physically threatening situation, led to a very stressful work environment. "This harassment makes me feel horrible about myself. They frequently mentioned my chest and always looked at my chest. I was so uncomfortable but said nothing." Just over one third (34%) of physicians who were harassed reported that the experience interfered with their ability to do their job. Whereas about one third of those who were harassed said that the experience did not affect their work, another one third said that they now avoid working with the person who perpetrated the harassment or abuse. About one fifth of those who were harassed thought about quitting their job, and more than 10% actually did so. Stress often leads people to turn to behaviors that make them feel better in the moment. In the case of harassing behavior, isolation was the most frequent form of coping. Sleeping and eating junk food were used as coping mechanisms to a lesser extent. Some have claimed that the focus on sexual harassment in healthcare has led to a number of people being falsely accused. Among physicians who had been accused, some admitted to doing wrong; some said their actions were misunderstood; and another group said the claims were false, and they were exonerated upon investigation. More than one half of those accused said that the incident of harassment was fabricated. For others, it's clear that people have very different ideas about acceptable behavior and boundaries. "Values have changed very much in recent years, and it's clear that some people just don't get it," says Strauss. "People may say their intentions were misunderstood, but intentions don't matter; it's the behavior and how it affects the other person." Among those who were accused, more than three quarters of the complaints led to an investigation. More than 70% of those accused of sexual harassment reported that they were exonerated; another 20% said that they were found to be responsible. Over one half of medical workplaces conduct sexual harassment training. Does it help? Probably to some degree, but in 2016, the US Equal Employment Opportunity Commission noted that trainings are often ineffective because they are 'too focused on simply avoiding legal liability.'" "How do they define their training?" asks Strauss. "If it just consists of watching a 20-minute video, it's not going to have much or any impact." National Women's Law Center; Raghu M, Suriani J. #MeTooWhatNext: strengthening workplace sexual harassment protections and accountability. Source Accessed May 22, 2018. US Equal Employment Opportunity Commission. Select Task Force on the Study of Harassment in the Workplace: report of co-chairs Chai R. Feldblum & Victoria A. Lipnic. Executive summary & recommendations. June 2016. Source Accessed May 14, 2018.